Motown has lost more than a million residents since its heyday in the 1950s and it is common to see downtown residential streets with just a few houses left standing. Taja Sevelle saw the hundreds of hectares of vacant land in the city and came up with the idea of creating an organic self-help movement that would be "affordable (and) practical". Beginning three years ago, armed with $5,000 (£2,500) and a pamphlet, the singer and entrepreneur managed to win a wide cross-section of support around the city. Now her charity is expanding across the US. Ms Sevelle is also keen to discuss her ideas with the new Mayor of London, Boris Johnson. With a handful of full-time staff, Urban Farming co-ordinates the cultivation of what amounts to 500 family-sized gardens across Detroit. Visiting one of the largest allotments, on a site that had been derelict since Detroit's infamous 1967 riots, locals spoke about an astonishing transformation. "There is something that every hand in this area can do," said Rose Stallard, who is keen to enlist as many volunteers as possible to help tend the garden and its precious crops. As she organises a band of eager helpers to pull greens from the rich top-soil, Ms Stallard says food is more expensive than ever and neighbourhood shops are scarce. "That's one cucumber you didn't have to pay 69 cents for," she adds, with a smile. There are no fences but one local said greed had not been a problem. "People are only taking what they need, because they know it's for everybody," he said. 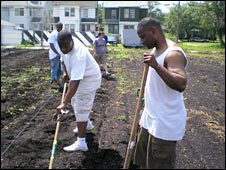 Many of the regular gardeners come from rehabilitation programmes linked to the county jail. Offenders say they have earned self-respect, as well as local thanks, for literally doing the spade-work. "It's good for me to know that I'm helping somebody, instead of hurting somebody," said Reginald Moore. "All this is positive. Next year, you'll see this all over," added Rod Shepard. Providing free food on the doorstep brings people together and spreads collective wisdom, according to local city hall manager Gail Carr. "Fresh fruits and vegetables are something that we all need. And we really, really need to educate our children in that area. "If we don't, we're going to have a lost generation to many diseases such as diabetes," she said. 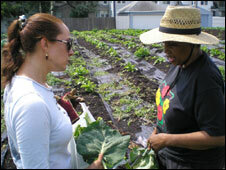 The local sheriff's liaison officer, Beth Roberts, said that crime figures had improved wherever Urban Farming took root. Growing crops also marked a return to slower but better times, she said. "We used to do this in our backyards. This used to be a culture, a way of life, so we're restoring that through urban farming." As the charity expands, it remains to be seen if enough local people will do the groundwork to keep the gardens blooming. But the idea of permanent social change, away from the old industrial core, is something that Detroit sorely needs, according to the editorial page editor of the Detroit News, Nolan Finley. 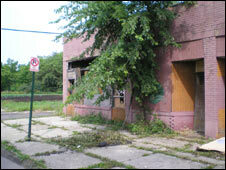 "Today's reality is that we have a lot of vacant space, and not much economic opportunity," he said. 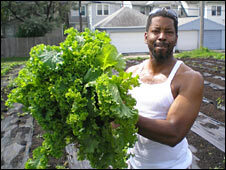 "You could have urban farming - you could have livestock in some of these stretches of empty land. "You could reforest it into tree farms so you're not maintaining a sidewalk, a power line, for a street that has two houses on it." The conversion from Motown to Growtown may seem far-fetched, but given Detroit's economic woes, marketable ideas are in big demand.